NIA CHARLESTOWN NEVIS (January 24, 2018) — The Nevis Island Administration (NIA) has placed the issue of crime high on its agenda. Hon. 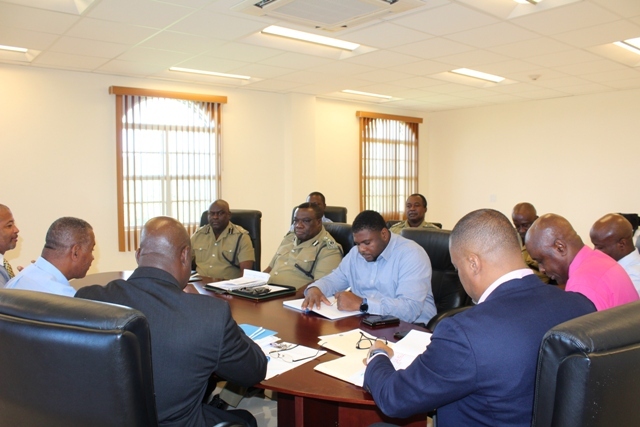 Mark Brantley, Premier of Nevis and other Cabinet members, met with the leadership of the Royal St. Christopher and Nevis Police Force (RSCNPF) Nevis Division on January 24, 2018, to discuss the issue of crime on Nevis. Mr. Brantley, who is also the Minister of Security, stated that safety and security is one of the most important duties of any government and he is hopeful the meeting is the first of several meetings going forward. 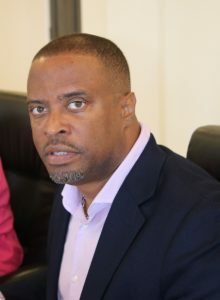 “It’s the first of what we hope to be several interactions with the high command as we move this process forward and as we better secure the safety and security of the island of Nevis,” he said. The Premier added that the matter of crime has been a troubling issue and the Administration is deeply concerned. However, they are charged with finding ways and means to curb crime and keep the people of Nevis safe. “Our police have our fullest support but we also require of them, that we get the necessary effort put in so that our people out there can have the necessary confidence that they are safe in their homes. They are safe in their communities. Mr. Brantley explained that the Administration thought it was important to meet with the senior officers at the Nevis Division to tell them of their expectations and to learn from them what their plans are. Present at the meeting were Hon. Alexis Jeffers, Deputy Premier; Hon. Eric Evelyn; Hon. Spencer Brand; Hon. Troy Jeffers; Mr. Stedmond Tross, Cabinet Secretary; Mr. Wakely Daniel, Permanent Secretary in the Premier’s Ministry; Deputy Police Commissioner Hilroy Brandy, Superintendent Trevor Mills, Divisional Commander; Inspector James Stephens, Officer in Charge of the Tactical Unit; Inspector Alonzo Carty, Officer in Charge of the Criminal Investigations Department and; Conrad Bertie, Officer in Charge of Charlestown Police Station. Hon. Hazel Brandy-Williams is at presently off island on official duties overseas and could not be at the meeting.